An estimated 500,000 children worldwide have been maimed by land mines. Even more, both adults and children, are survivors of acts of violence, political oppression, vehicular and other accidents, and birth defects. The LN-4 Prosthetic Hand Project was spearheaded by Ernie Meadows as a memorial to his daughter Ellen. Visit theLN-4 website to hear the story of how Rotary became involved with the hand and how Rotary Districts 5110 and 5160 joined together to provide the hand for those in need . . . . at no cost to the recipients. Learn more about the hand . . . learn how it works . . . read the reports from the teams that put the hand through its trials . . . view the photos of the recipients . . . and learn how you can become involved in this most worthwhile endeavor. The Rotary Club of Gold Beach has participated in this project by learning more about it through presentation at the weekly luncheon meeting, and subsequently expanding the Ghana Clean Water Project to include identifying and fitting residents of Ghana with these prosthetic devices. Following are excerpts of correspondence from Tony and Terri-Lynn Kalhagen who traveled to Ghana and provided four persons with an LN-4 Prosthetic device. Providing clean water to needy communities worldwide has been a key emphasis of Rotary International Presidents for many years. The Rotary Club of Gold Beach has identified this as a club goal since 2006 – thanks to the enthusiasm of local community members Toni & Terri-Lynn Kalhagen. You are invited to partner with the Rotary Club of Gold Beach to fund an International Service Clean Water Project in Upper East Ghana. In 2006, Gold Beach residents Tony and Terri-Lynn Kalhagen traveled the unimproved roads, rivers, and trails of west Africa to reach the village of Gungabisi in Bolgatanga, the Upper East Region of Ghana. Their purpose was to meet the women who produce the beautiful Bolga African basketry. The tale of their adventure is remarkable, as is the need of the villagers throughout Bolgatanga. To sustain their village, the women of Gungabisi must daily carry untreated river water for miles. No other source of water currently exists, so villagers have a dire need of a well for clean water. The Rotary Club of Gold Beach has structured an International Service Project to fund the development of wells in Bolgatanga. Our goal to build one or more clean water wells for the village of Gungabisi in the fall of 2008 was accomplished. The cost of one well was 3,500.00 Ghanaian Cedis (about US $3,500.00). Development of a well at that time took approximately two months. And, that was just the beginning. In November 2008, the Kalhagens returned to Gungabisi, where Tony and Terri-Lynn filmed the completion and dedication of the village well for Rotary International. The project has grown and more wells have been identified in other villages (4-6), a school and a medical clinic have been added to the project – now deemed the “Ripple Effect”. The scope of the project has increased along with the budget. The Gold Beach Rotary Club has agreed to help raise funds in the amount of $25,000 to make this dream a reality. Join with us…ask us how YOU can participate. In spring of 2011, a second Rotary fresh water well was developed in the village of Bon Gurugo Asaloko This well was actually drilled using borehole mechanical equipment as opposed to the first well in Bolgatanga which was hand dug. A third well is slated for completion in late 2011 – to be dedicated during the Kalhagen’s next visit to Ghana in November 2011. They will be taking additional photos and video of the wells. 10 other travelers will be ‘touring’ with the Kalhagens for a great adventure! We’re pleased that the Kalhagens have chosen the Gold Beach Rotary Club to partner with in their clean water efforts. Since it’s establishment in 1982, Rotary First Harvest (RFH) has collected and distributed more than 135 million pounds of produce. RFH acts as a conduit between farmers and the programs that serve hungry individuals and families. Farmers are occasionally left with surplus fruits and vegetables that can’t be sold due to minor imperfections (such as carrots with two legs or apples that are the wrong size or color), or might not be harvested because of a glut on the market. The Rotary Club of Gold Beach participates in Rotary First Harvest is several ways, one of which is to participate in the purchase of raffle tickets offered periodically. For more information, contact your local Rotary Board member or the Rotary First Harvest website. The Rotary Club of Gold Beach’s Scholarship Committee works closely with the local high school in soliciting applications for scholarships and evaluating the applicants. Scholarships are awarded annually near the end of the school year. The Rotary Club of Gold Beach works closely with the High School teaching staff and administration to determine deserving candidates for recognition. The winners are invited to attend a a club luncheon meeting and asked to speak briefly about themselves and their goals and are awarded a certificate and a gift of appreciation. The Rotary Youth Leadership Award (RYLA) is awarded to two deserving high school students annually. Consequently, the students participate in a ‘Leadership Camp’ and gain valuable leadership skills and experience. Many prior attendees have gone on to become leaders at their school and beyond. Each year, the Rotary Club of Gold Beach has the opportunity to sponsor both an inbound and an outbound exchange student. The inbound student arrives sometime in August and spends the school year with at least three Rotary families in the community while attending Gold Beach High School. Recent exchange students have come to us from Ecuador, Brazil, and Columbia. The purpose of the exchange program is to promote the understanding of different cultures. Our exchange student attends our weekly meeting and shares their week’s experience with the club. During the year, the student also regularly meets with the other exchange students in the District, often forming lasting relationships. The student often prepares a presentation about their home country for the club. Most recently we were pleased to host Olivier from Belgium! She stayed withGold Beach families in 2014 / 2015.Olivier attended most weekly Rotary meetings and it was a pleasure to see him transform during his time in Gold Beach. His language skills improved dramatically, he adapted well to small-town America from his familiar large city home, he visited with many other exchange students, and enjoyed travels throughout Oregon and beyond. Recent Outbound students from Gold Beach have traveled as far as Brazil. Rotary Exchange Students Over the Years. Below are the students we have hosted. Look at all the Gold Beach Rotary Exchange Students we have sponsored over the Years. Below are our local students that have traveled through the exchange program. Each year, the Rotary Club of Gold Beach works closely with the local school district to not only present each 3rd grade student with their own dictionary but also visit the school and instruct the students in their use. It is a fun occasion for both the youth and the rotarians! The Rotary Club of Gold Beach participates each year in The Dictionary Project. The goal of this program is to assist all students in completing the school year as good writers, active readers and creative thinkers by providing students with their own personal dictionary. The dictionaries are a gift to each student to use at school and at home for years to come. Reading is the most important skill of all. It is the starting point for all the economic and social opportunities this world has to offer. Educators see third grade as the dividing line between learning to read and reading to learn. Every year we watch The Dictionary Project grow by expanding our pool of sponsors, so more children can enjoy the benefits of owning their own personal dictionary. Ready to Smile is a citizen-driven effort to improve children’s dental health. Ready to Smile coordinates and provides services that prevent and treat children’s dental health problems. • Dental sealants, fluoride varnish and oral hygiene kits to participating students in the above grades. Licensed dental hygienists and assistants provide these services. Dental screenings and sealants are provided by dental professionals at no cost to the students, along with oral hygiene education to prevent cavities. Mobile dental van visits are organized to serve students who need cleanings and treatment. In addition, students are referred to local dentists for treatment. Ready to Smile is managed by a local Steering Committee representing Coos and Curry counties. The program is coordinated by Cecilee Shull of Coos County Public Health. In 2010, the Rotary Club of Gold Beach and the Curry Health Foundation coordinated their main fundraising event/goal to help support this effort. The Annual ‘High on Health’ dinner raised over $21,000 which was then matched by the Oregon Community Foundation. The Ready to Smile program is fully funded for at least three years. During the 2010/2011 school year, kids in Curry County received over $75,000 in dental care, including screenings, sealants, fluoride varnishes, education and referrals to needed services for grades 1, 2, 6 and 7. In 2011/2012, these services will be expanded to also include dental vans at the schools as needed. Ready to Smile has been made possible by generous contributions from The Oregon Community Foundation, The Ford Family Foundation, Curry Health Foundation, Gold Beach and Bandon Rotary Clubs, Thrivent Financial for Lutherans, Wild Rivers Community Foundation, Soroptimists of the Coos Bay Area and many volunteers. 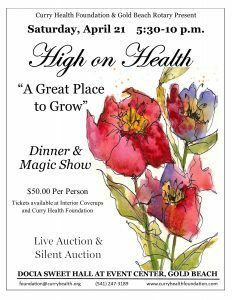 Each year, the Curry Health Foundation and the Rotary Club of Gold Beach work together to assemble this fundraising benefit dinner – High on Health. In 2018, we are pleased to have host Magician Adam the Great, with both live & silent auctions. Proceeds from the event will be used for health related needs in the area.